Greenery and floral arrangements provided by tradeshow florists can enhance your exhibit display and give your booth area a distinctive finishing touch that makes it stand out from others. Whether your display space is large or small, thoughtful selection and placement of plants and flowers can create a warm, inviting environment. In addition, attractive floral arrangements and trees reflect a reputation of exceptional quality that will attract additional visitors to your exhibit. Greenery and floral creatively fill corners, compensate for empty areas, and cover unsightly wiring, fixtures and storage areas. If properly placed, the coordinated arrangements and greenery can help direct the traffic flow in and out of your exhibit area, as well as help draw additional attention to highlight your product offerings. When choosing greenery and floral options, complement the graphic elements, colors and overall look of your display. For example, if you are promoting a high-tech product or service, work with your florist to create arresting contemporary flower arrangements. Or, based on your industry and booth design, you may decide that more traditional or elaborate flowers and plants better support your image. Consulting with an experienced florist well in advance will help you determine what arrangements and placements work best for your exhibit. Talk with your event sponsor about recommended florists in city where the event will be held. 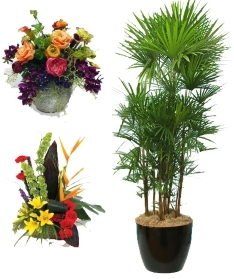 Inquire about delivery schedules, onsite service and plant care.